When you’re launching a new business, you already have a lot on your plate. With everything from getting your phone lines turned on to making sure your payment system is working properly, there’s a lot to keep track of. One of the essential tasks that sometimes end up falling to the side is social media. This is a shame, because social media is one of the best tools you can use to launch your business. 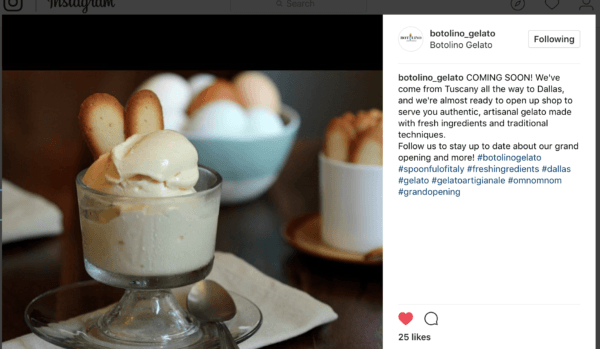 Whether you’re hosting a grand opening event or just looking to increase your client-base quickly, social media can help you introduce your business to new customers so you can start getting sales as quickly as possible. In this post, we’re going to go over exactly when and how you should tackle your social media launch for your business so you can hit the ground running. When Should I Start Promoting My Business on Social Media? If your business is brand new, you should start preparing your social media marketing plan long before you actually ever open your doors (real or metaphorical). This gives you time to get your profiles set up and to start to get some attention from your target audience. 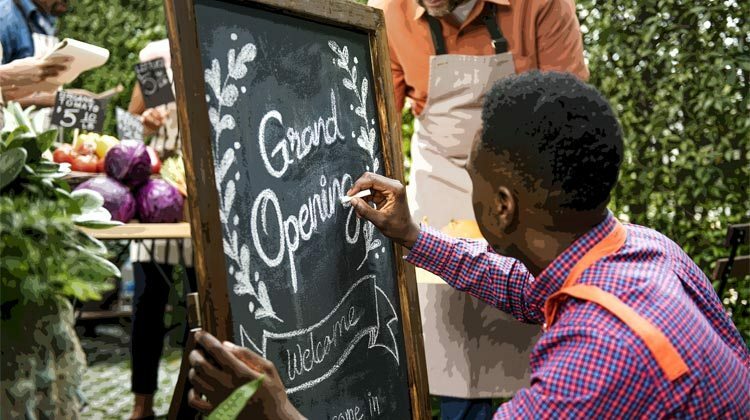 By gaining traction on social media before your business opens, you’ll have a resource where you can keep people updated about your business’s launch and grand opening events. This is hugely valuable. Getting started on social early will also help your profiles look a little more fleshed out when it’s time for users to actually come to see them. Instead of having just one post, you’ll have a number of posts uploaded that they can scroll through to get an idea of what your business is. You should start creating your profiles, if possible, about a month and a half before you officially launch your business. At this point, you should choose which profiles you want to use. I highly recommend that all businesses have both Facebook and Instagram. B2B businesses should also be on LinkedIn and most B2C businesses should be on Pinterest. During this time, even though the launch seems far away, you should create your social media profiles. For Facebook, you should make a Page and not a profile. 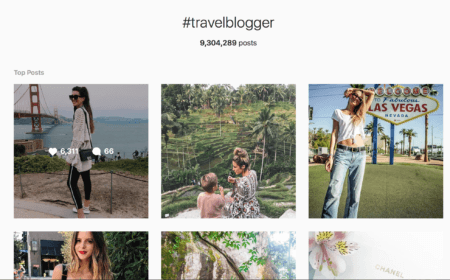 On Instagram and Pinterest, you can convert regular profiles into business profiles to access features like analytics (see how on Instagram here, and Pinterest here). There is no difference between a regular profile and a business profile on Twitter, but you will want to make sure your profile is public. If possible, choose the same profile name on every single profile and use the same profile picture for each. Try not to be @d_advertising on one, for example, and @disruptiveads on another (our actual profile name). Consistency is key to helping you build brand recognition, which is essential for new businesses. Once you do this, you’ll want to start ramping up for your social media launch. The first step in doing this will be to add the right information to every platform you’re using. Your social media profiles (particularly your Facebook) can act as central hubs where users can go to find more information about your brand. You’ll want to take advantage of this and make sure each profile provides as much crucial information as possible. This will be different for each platform, but each profile should emphasize your brand’s personality and what you have to offer. This step is one that is often overlooked until several months in to the social media strategy, which is always a mistake. You want to do fairly extensive hashtag research, as this will go a long way in helping you launch your brand on social media by increasing its visibility significantly. Hashtags are clickable, searchable topics that can help you connect with your audience. Hashtags can help you be seen by your target audience on both Instagram and Twitter, so choosing the right ones matter. You’ll want to search for hashtags that are used by audience members interested in your industry, along with hashtags used by your local audience, or those for special events. 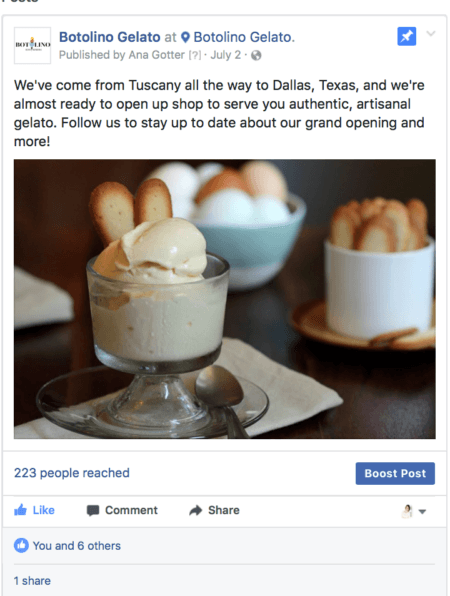 In the example below, a soon-to-launch gelato shop uses its branded hashtag (#spoonfulofitaly), location hashtags (#Dallas, #Texas), industry hashtags (#omnomnom), and event hashtags (#grandopening) to reach their target audience. You’ll also want to create branded hashtags so you can start generating user-generated content right off the bat. 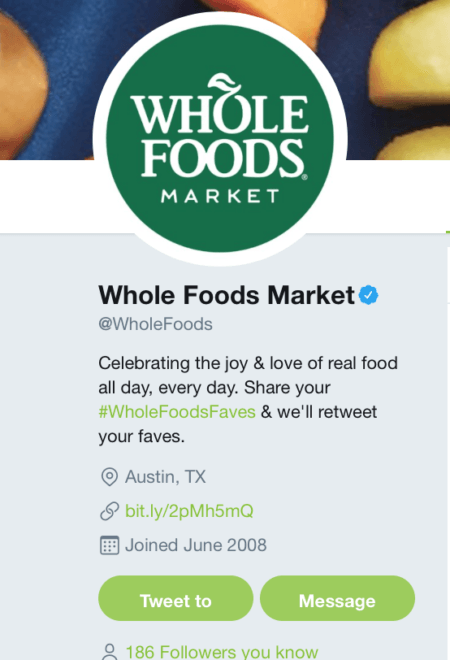 After doing your initial research, create one or two hashtags that aren’t being used by any other brand. Place these in your Instagram bio, and I recommend using them in every post you share on Instagram. At this point, you’ll start to want adding more content to your pages and profiles and increasing the marketing overall. For most businesses, this is the sweet spot to start marketing your business. It’s far enough out that you can build momentum, but not so far that users don’t care. At this point, it’s time to start sharing posts on each platform, which should increase in frequency the closer you get to opening the actual business. While two posts a week could suffice for one week out, the week before your launch should have at least one post per day on Facebook and several per week on Instagram and Twitter. The more customers are able to learn about you through social media, the more they’ll trust you, and posting is a great way to give them that information. Keep a post pinned at the top of both Facebook and Twitter announcing your grand opening and business launch date. This will be the first post that users see when they come to your page, so having it contain information about your launch date will help keep viewers up to date. Grand openings are important, particularly for B2C, brick-and-mortar businesses that rely on customers coming to you. 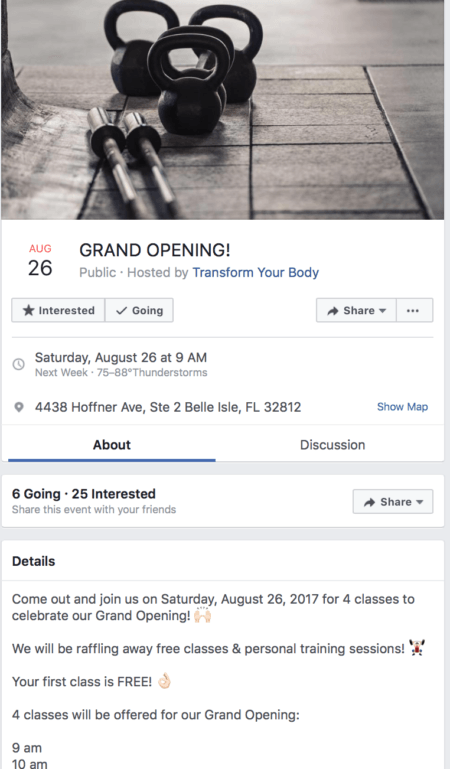 Create a Grand Opening Event with Facebook events, and then share it on Facebook and Twitter and mention it on Instagram. You can update guests about your opening day, and get a very rough estimate on potential interest in attendance. You can read more about creating Facebook events here. As you get closer to launch, you’ll want to seek out influencers. Start following them on social media and engaging with and sharing their content. You can also reach out directly through PM and let them know about your new business and its launch date. If you have the ability to offer influencers benefits like exclusive access ahead of time, this is a good time to do so. 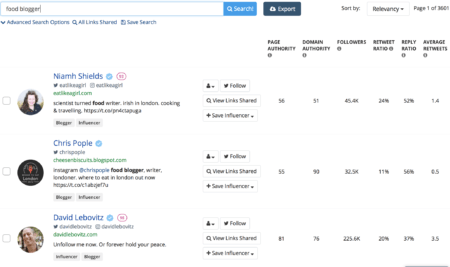 Tools like BuzzSumo can help you identify and connect with influencers. If you’re feeling stumped about how to find or connect with influencers, try using tools like BuzzSumo. The big day is almost here and this is when you really want to increase your outreach efforts to both customers and potential influencers who may be interested in your product. Now, the business’s launch is so close that you can get users excited without worrying they’ll lose interest. If they say they’ll come to an event, there’s a much better chance they will. You want to stay fresh in their mind so that they’re just as ready for opening day as you are. At this point, regular posting is especially important. Post everything from reminders about your soon-to-be launch date to behind-the-scenes photos of you all getting ready. Share snippets of information about what you’re excited to do for your business, along with any media about your business (including press releases or reviews from bloggers or influencers). Social scheduling software like Agorapulse (pictured here) can help you increase posting frequency. Because this will require a lot of time and energy, I recommend using social scheduling and publishing tools like Agorapulse or Sprout Social. These tools automatically publish content you’ve scheduled on multiple platforms, saving you a lot of time. It’s also sometimes easier to sit down and plan out most of your posts for the week all at once. Monitor your posts particularly closely for engagement, including questions from customers. Take extra care to answer them as promptly as possible so you can build up your “responds quickly” badge on Facebook. Once you’ve completed all these steps, it’s time to launch your business! Don’t forget to change up any PPC ads that may have content like “coming soon” or those promoting the opening day, adjusting them to reflect other offers or events. You’ll also want to document the live event through photos, videos, UGC, and even live video to share on social so you can keep the momentum you’ve got going. Need some assistance with your social media launch, or PPC campaigns leading up to the launch? Leave us a comment or send us a note here. What do you think? 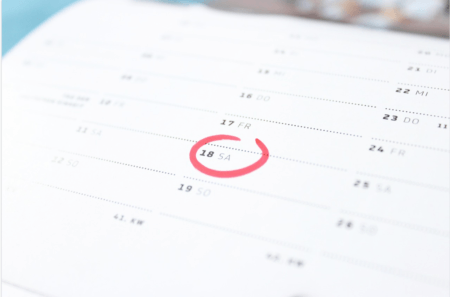 Did you follow this timeline for your social media launch for your business? How did you promote your business before it opened? Share your thoughts in the comments below! Do you have a draft or sample of an announcement which I can refer to for further help?